If you are planning a trip to Florida, a Greek island or the French Riviera, you may certainly decide to rent a self-catering apartment to offer the freedom and independence to relax. But when planning to visit a city, whether for leisure or business, most people think no further than checking into a hotel. It seems the obvious place to stay. Coming to Edinburgh? - perhaps for the summer festivals or the festive Christmas and New Year events - then why not stay in your own private home bang in the centre of the Old Town. 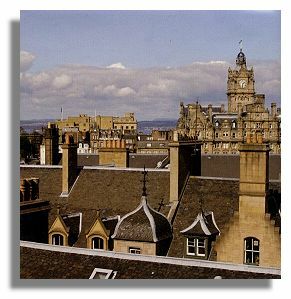 The Royal Mile Residence has recently opened on the historic High Street, also known as the Royal Mile as it runs from the Castle down to the Palace of Holyroodhouse. The Residence offers six luxurious, creatively designed two-bedroom apartments, each with a spacious living room, kitchen and bathroom. While the interior design has the stylishly cool and contemporary IKEA look, the old grey stone tenement building is of great classic architectural significance. 219 High Street dates from the early 18th century and appears on Edgar's 1742 map of Edinburgh. There's a plaque on the wall above the entrance gate stating that the building was formerly a maternity hospital founded in 1904 by Elsie Inglis who was a pioneering doctor improving medical treatment for women and children. The Residence is in the heart of the Old Town with its steep cobbled streets, narrow wynds and closes and tiny hidden courtyards dating back to the 16th century. The whole area is now protected as a World Heritage Site. 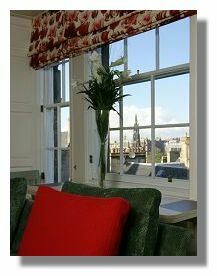 Windows from each apartment look out over the High Street or over the pitched roofs, chimney pots and turrets to Princes Street Gardens beyond, with a wonderful view of the Balmoral Hotel and the Scott Monument. So let's have a good look around the apartments to explain exactly what you can expect if you come to stay. Apartments 4 and 5 are on the first floor, up a short flight of steps from the entrance gate at street level (this is kept locked for security). The decoration and furnishing throughout is of the highest standard with quality wallpapers, blinds, fabrics and a contrasting blend of colours from dark maroon to bold green and red selected across different rooms. Large sofa, a couple of armchairs, fat cushions and coffee table "pouffé" are covered in tweed and suede. Table lamps around the room offer good soft lighting. The two bedrooms (double bed and twin beds) have luxury cotton sheets, soft pillows and thick duvets, with heavy plaid blankets. You are not likely to feel cold even in the heart of winter with good central heating. Facilities are first rate and far superior to your usual hotel room or even a large suite - for your entertainment and relaxation you'll enjoy a windscreen TV, Cable TV, internet access, DVD/CD player, and on the domestic front the ultra modern kitchen is filled with stylish stainless steel appliances, crockery, glasses and all cooking utensils you would require to prepare meals including a microwave. And to make life even easier there's a dishwasher and washing machine/dryer, while bath towels and toiletries are also supplied. And so you have arrived, unpacked and have settled into your temporary home in Edinburgh with a key to your own front door. From here within a few minutes walk is the Castle, St. Giles Cathedral or stroll down the High Street, full of attractive shops selling cashmere, whisky and gifts. 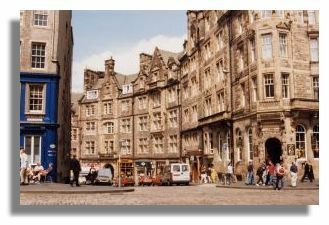 Walk down the curving cobbled Cockburn Street, (lively cafes, bars and boutiques) and five minutes further on you'll reach Princes Street and George Street with all the well-known chain stores and designer fashion. 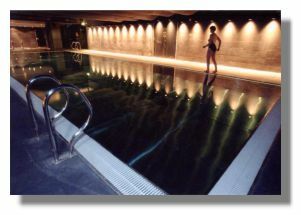 A real coup for the Royal Mile Residence is to secure complimentary membership to Escape, the state of the art sport and leisure centre at the Scotsman Hotel, around the corner on North Bridge, just off the High Street. Guests are given a free member's card during their stay. Here you'll find the most stunning stainless pool where swimming is by soft subdued lighting or relax in the sauna, steam room, spa bath and tropicarium. Keep fit in the cardio vascular gymnasium fitted with latest equipment and weights. Escape is also a Spa where there is a full menu of beauty and health treatments to pamper the face and body. The rooms situated away from the pool and fitness area are completely enclosed in a quiet, Zen like sanctum, candles burning where you can just lie out and be massaged and detoxified with aromatherapy oils. Special day packages featuring two or three treatments available including lunch. Then chill out in the relaxation room where herbal teas and water will be brought to you with a magazine - or just rest and sleep. As a self-catering apartment you can choose to save money on cooking your own meals "at home", with grocery shops nearby and an off-licence just down stairs. Alternatively you have the choice of every style of restaurant, bistro, pub and takeaway nearby. Tea, coffee and milk is supplied in the apartments but forgotten to buy bread or cornflakes? Don't worry - go round the corner to Southern Comfort on Cockburn Street for a great fry up of egg, beans, bacon, sausage, haggis, hash brown, mushroom, tomato and toast, (veggie option too) or filled rolls - full marks for breakfast served all day; also lots of great cafes around about, including Always Sunday on the High Street. For lunch or dinner, a special recommendation goes to the North Bridge Brasserie, adjacent to and part of the Scotsman Hotel just around the corner. Previously the grand hall of the Scotsman newspaper, the original giant marble pillars and new steel spiral staircase to mezzanine level gives a stylish setting for a meal. Food is equally stylish with Crab cakes, Tiger Prawn and avocado salad, speciality grills (beef, tuna), scallops, pasta and risotto dishes. Good side dishes of salads, Olive Oil Mash and Potato wedges. Keep space for pudding such as Lime Tart or Chocolate Brownie and Mascarpone Ice-cream or platter of Scottish cheese. For a weekend break, business trip, perhaps a family holiday or a week in August during the Edinburgh Festival, the Royal Mile Residence offers the visitor the most perfect place to stay. Complete privacy, independence, home-from-home comforts, where you can cook in or eat out, and the luxury of a health club around the corner. 10 out of 10 for style, comfort, interior design and mod con facilities. Check it out for your next visit to Scotland's capital. 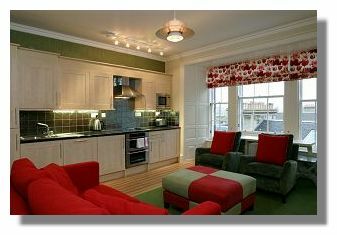 For more information or to make a reservation see the Royal Mile Residence Web site or e-mail info@royalmileresidence.com. 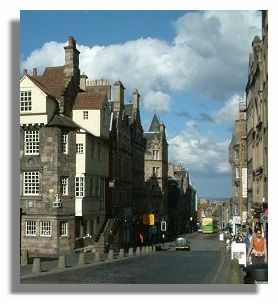 The postal address is Royal Mile Residence, 219 Royal Mile, Edinburgh EH1 1BU.